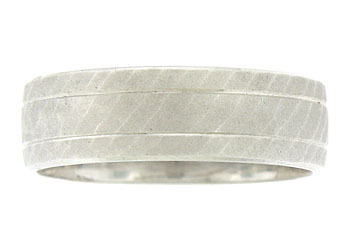 This handsome, wide mens wedding band features a pair of deeply engraved channels that encircle the wedding ring. A fine, engraved watermark design covers the rings surface. 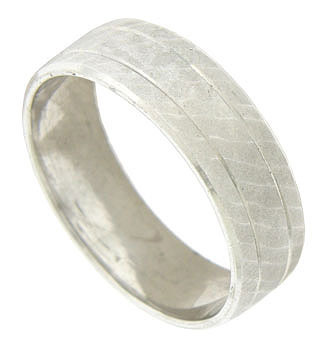 Crafted of 14K white gold, the ring measures 6.81 mm in width. Size 10 3/4. We cannot re-size, but we can reorder in other sizes. Also available in 18K, platinum, yellow, red and green gold. Contact us for current market cost.